Various kinds of magnet assemblies are commonly used to affect the path which charged particles follow. This can be for particle accelerators, beamlines, ion traps, or miscellaneous similar applications such as plasma confinement. The magnets are typically used for some combination of steering and focusing beams of charged particles. 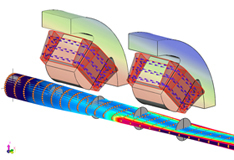 By including the LORENTZ analysis module, any of INTEGRATED’s magnetic analysis programs can be used to simulate such applications.